Can Tyler Landman retain his title for a second year running? Find out live on 9-10 July. The battle to determine the best British boulderer is coming soon and will be available on livestream. Will Shauna Coxsey be crowned number one yet again? 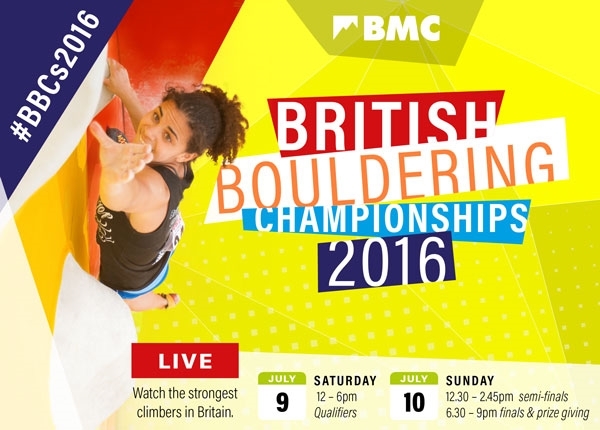 The British Bouldering Championship (BBC) will be the highlight of the Cliffhanger festival, but don’t worry if you can’t make it – we’re streaming all the action so you can watch it as it happens, without any spoilers. But that’s not the only reason we’re psyched, because we can’t wait to see who’s the storngest and ends up on the top-spot. This year’s competition will stick with the World Cup format, meaning we get to see 120 climbers from around the country come and test their mettle, their mantles, their horrible gastons and their tip-slicing crimping power. 40 climbers will make it through to semi-finals and of these, only six female and six male will get to test their strength on the final problems. Shauna Coxsey, IFSC Boulder World Cup Champion, has been storming to Mens Cartiersuccess this year on the international circuit, claiming the title of overall champion with an event to spare. Can she keep her form on home ground when up against her GB Climbing Teammates? Last year’s male champion, Tyler Landman, wrestled the title away from Dave Barrans and put an end to his three-year winning streak. Can strongman Tyler fend off pocket-dynamo Dave and start building up his own winning streak? We can’t wait to find out. Let’s not forget the host of strong climbers that will also be vying to make the podium, especially from the younger generation where there’s an amazing crop of talent that is continually improving and getting stronger – such as those that have been representing the GB Climbing Team on this year’s international circuit: Tara Hayes, Nathan Phillips, Billy Ridal, and many more. Please don’t be put-off by the login on the livestream webpage; it will disappear once the event is running. If the thought of having a livestream of action-packed bouldering wasn’t enough, we’ve also got an all-star cast of pundits and commentators. We’ve got world-class climbers Mina Leslie-Wujastyk and Gaz Parry, both former competitors in the BBCs themselves, to commentate on the action and make sure you don’t miss any of the subtle techniques and beta that helped see that send. Meanwhile, acting as pundit, we’ve got loud but friendly Liam Lonsdale to keep building up the energy of the crowd until it’s at fever-pitch and ready to blow the roof off. There’s loads more going on, including interview with pros and prizes to give away, so if you can’t make it to the real deal then tune in for the next best thing.